When it comes to pool water testing, there are two goals to keep in mind. One is to make the water safe for your family to swim in. The other is to keep it looking nice and clear. If you do not use your pool often, you might only perform pool testing on a weekly basis to make sure the pH, chlorine, total alkalinity, and calcium hardness are not out of whack where they could harm your pool, pool equipment, or turn the water murky. If you are going to be using your pool, you should increase the times you perform pool testing considerably to several times a week. 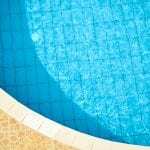 Commercial pools should be checked once per hour because of the increased usage. It is never a bad idea to do pool testing right before a swim. It only takes a moment to use a basic home test kit to make sure that nothing is so far off that a swim could be dangerous. However, this isn’t a substitute for professional pool testing, which you should also do regularly. It is a common misconception that as long as the pool looks clean, it is safe. It can still harbor bacteria and have levels that can create serious chemical burns on sensitive tissue. If you are unsure of how to perform pool testing, come see us at Cayman Pool & Spa. We can help you better understand how this works and perform professional pool testing to let you know what chemicals your pool needs.